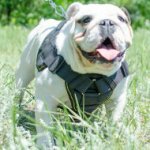 Which Attack Training Harness for Bulldog to Choose? 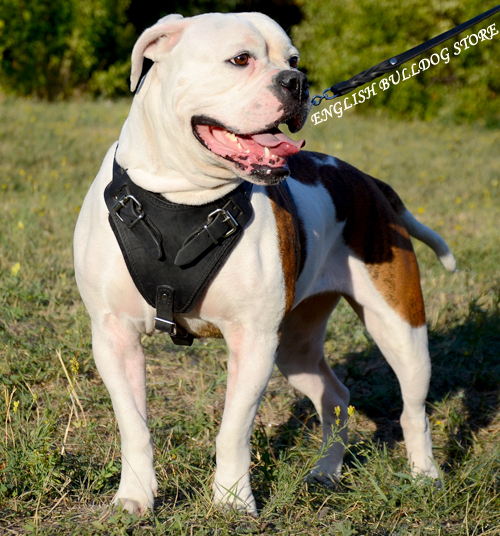 American Bulldog attack training is the work with heavy loads and shocks and a dog's breast is the most sensitive body part that should be maximum protected. Professional trainers use specialized attack dog harnesses, which are extra durable and have wide chest plates for Bulldog safety. 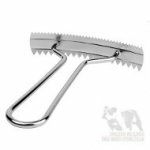 Y- or V-type plate keeps with anatomical structure of the dog. 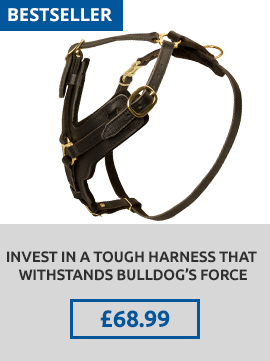 Such a harness will save Bulldog's neck from loads and will fit it perfectly. A harness for attack, agitation and protection training is meant to be tearproof, harmless and cozy. There are 2 models of pro harnesses for this kind of training. 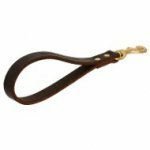 They are made by hands of full grain natural leather, which is thick and hard-wearing, but hypoallergic and dog-friendly. Both harnesses are well-processed, oiled and polished along the edges. 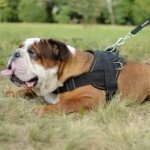 Your Bulldog will have neither rubbing, nor injuries with any of these harnesses on! The first variant of the harness has wide breast plate in the shape of triangle. 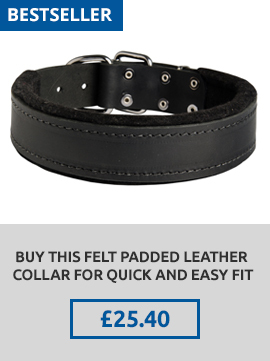 It is lined with felt as well as neck straps and back plate to be exceptionally comfy and painless. Leather straps are durable and wide. 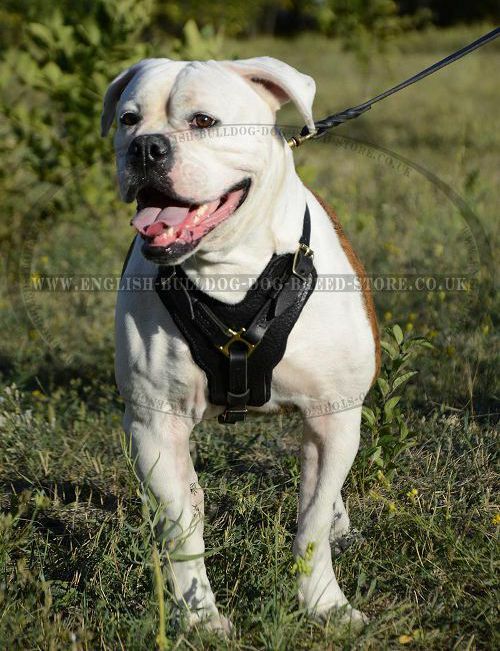 It is easy to regulate them with the help of traditional buckles to fit the harness to your Bulldog dimensions. The harness is put on with quick-released buckle for handy use. All the fittings are of nickel-plated steel. They are welded, sound and rust-resistant. A leash is connected with the D-ring on the back plate. It is securely stitched and won't tear off. The harness is intended for medium and large Bulldogs. There is an option of colors (black and brown) and a handle choosing. 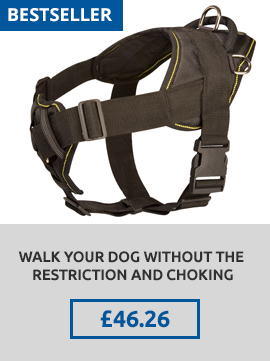 The harness with handle provides more control over the dog during training. Careful stitching of this harness and riveting of metal details makes this gear extremely strong and ensures its long-term use. The harness is widely used by experienced cynologists and is suitable for daily usage. The second variant of the harness has large Y-shaped chest plate, which is also felt-padded alongside with back plate. The design of this harness is robust and resilient. It is 4 ways adjustable with the help of straps and standard buckles. Quick-detach buckle serves for fast and easy Bulldog harnessing. Gold-like brass hardware is a distinctive feature of the harness. It is of luxury look together with functionality. Brass is copper and zinc alloy, which doesn't cause allergy. The fittings are break-resistant being welded. Each of them is reliably sewed and fixed with rivets not to fall away. Straight and fine stitches add durability to this harness. 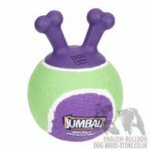 Outstanding design will accentuate your Bulldog's strength and beauty. Attach the lead to the D-ring on the back plate and be ready to train the dog! The harness is suitable for medium and large-sized Bulldogs. It is produced in several sizes, black and brown colors, with or without handle. It will serve your active and powerful pet for many years.